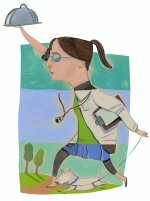 How real nurses find energy for work and home. Laura’s plate of cookies sits at the nurses' station after the unit potluck. You walk by and take one. It’s just a harmless cookie. When you pass by again, you take another. Pass again: another cookie. By the end of your shift, you’re not sure how many cookies—and calories—you have consumed. Every nurse experiences the physical stress of the work and knows intellectually the importance of a healthy diet. In addition to the obvious weight gain, the walk-by diet can raise your blood pressure and blood sugar, and contributes to diabetes. So how do you eat right in a world of Laura’s cookies that beg for your attention? You probably have friends who swear by this tactic: Eat healthy throughout the work week and satisfy your cravings on the weekends. It has been coined the “Weekend Diet.” Some dietitians recognize it as an alternative to eating junk all the time, and note that it can curb feelings of deprivation. But this method demands moderation. If you go to the movies and order popcorn, skip the extra butter and order the kid’s size rather than the jumbo. You won’t maintain—or lose weight—if you overindulge. As you know, a high-fiber diet lowers your blood cholesterol levels, controls your blood sugar levels, helps you maintain and lose weight (because you feel fuller longer), and even can prevent you from developing cancer. You know what food gives you energy—and you know what makes you feel lousy. Choosing to pack a lunch gives you control over your diet and, ultimately, the overall effectiveness of your day. When your brown-bag it, you have easy access to healthy food, especially on days when you’re so bogged down a jaunt to the cafeteria feels like a luxury. Chances are you’ll be better able resist the diet-crusher “walk-by” foods. Yes, time can be an issue. But, according to Suzanna Dickson, RN, BSN, if you keep it simple and pack fresh fruits and vegetables, it can work for you. To minimize the time she spends thinking about what she’ll pack for lunch, Sharon LaCroix, RN, BSN, often sets aside a portion from dinner the night before. In the morning she just grabs and runs—so she’s not running out for a burger and fries come lunch time. And remember: What you lose in time you’ll make up for in saved cash. Statistics show that you can save $4 a day by brown bagging it—that’s more than $1000 a year. If you have kids, you know the importance of a snack right after school so the homework gets done. Opt for fresh fruits and vegetables, 1/3 cup of mixed nuts, or a 1/4 cup of pretzels. If you’re heading out to the local coffee shop for a midday pick-me-up latte, opt for skim milk drinks and skip the sugary syrups. Kim Rapper, RN, BSN, keeps a protein bar in her pocket so it’s accessible at any moment—and so she won’t cave to the M&M’s at the vending machine. And veteran nurse, Kathy Quan, RN, BSN, PHN, recommends bringing trail mix that you can leave on your desk for the quick fix. The key is to pick grab-and-go foods that pack a lot of protein and nutrients—and are low in fat—so you feel satisfied and can keep your energy up through the end of your shift. I always bring my lunch and try not to bring money/change with me to work….this makes me eat junk out of the vending machine. Drinking water keeps me satisfied and helps me not eat as much. Thanks for all the good tips! Sounds like I’m in for a change in the new year – to eat healthier and save money at the same time! now i just feel lousy for getting my extra large DnD coffee every morning and not packing a healthy lunch. I agree with the protein bar idea. If you buy a bar that is nutritious yet satisfies your sweet tooth, it’s much easier to say no to the cookies/candy tempting you in the break room every single day! The indulge on weekends tip doesn’t work for me because I work every other weekend. My schedule is never consistent and that makes it even harder to eat healthy. Luna bars are great!!! I’ve tried all kinds of bars and found these are low sugar packed with all the good stuff. They also taste really good. All my friends are addicted now. One thing I love are Nature Valley Oats & Honey bars. Another yummy snack: pieces of apple with peanut butter. Mmmm…saltly & sweet! Jif actually sells individual snack packs of peanut butter. Yum. You can put it on the Oats & Honey bars too if you’re really hungry and need the protein. Good luck with the healthy eating! I know it’s been hard for me to get used to. I pack my lunch every day, which saves money, and I can only eat what I take with me, so that helps with calories. Count the serving size. For a sweet, I just bring, like, one Hersey’s Kiss, just to end my meal… My prob. is my gut gets totally messed up because I can’t always go when I need to, and when I can go, I can’t… if that makes sense… Any ideas?